You are here: Home » Featured » My Little One, Am I Not Your Mother? My Little One, Am I Not Your Mother? Today the Church celebrates the Feast Day of Our Lady of Guadalupe, a great appearance of the Blessed Virgin Mary to St. Juan Diego, which forever changed the course of history in the Americas. Her appearance on Tepeyac Hill, Mexico in 1531 helped convert millions and millions of people in the New World — Native Americans, meztizos, and European settlers — and encouraged unity in what was a relationship marked by warfare, suspicion, and antagonism. “It was Saturday, not yet dawn, when he was coming in pursuit of God and His commandements. And as he drew near the little hill called Tepeyac, it was beginning to dawn. There he heard singing on the little hill, like the song of many precious birds. When their voices would stop, it was as if the hill were answering them. Extremely soft and delightful, their songs exceeded those of the coyoltototl and the tzinitcan and other precious songbirds. Notice the flowers blooming and the birds singing in the account, how the cacti and the wild animals are glistening and “shining like gold”. The land, marred by war and conquest, itself seems to speak of a rebirth. The stars on her tilma that St. Juan Diego sees reflect the celestial nature of this apparition. All of these signs speak to the wonderful things that are about to arise in the new world: An entirely new civilization. A new people to come. It must be pointed out also that the Church is not oblivious or ignorant of the painful history during this period between the Church and the New World. After all, Archbishop Charles Chaput — a member of the Powatomi Indian tribe — in his recent address to the bishops from Canada, the United States and Latin America, said as much: “More than 500 years ago, men came from the Old World of Europe to the New World of America. They brought with them their pride and avarice, their illnesses and sins. But they also brought a treasure beyond price — the Word of God, the Gospel of Jesus Christ.” This is why must remember this story and celebrate this feast in light of the latter, not the former. 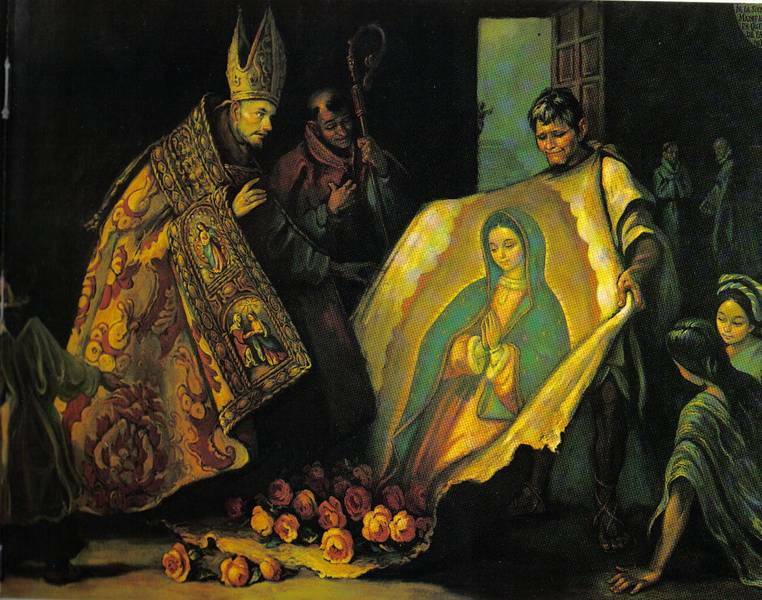 Our Lady of Guadalupe came to St. Juan Diego and had a message for him to bring to the peoples of the New World. She, crushing the serpent’s head and standing in front of the sun, was stronger than the gods of the Aztecs that demanded human sacrifice (Genesis 3:15, Revelation 12:1). She also was stronger than the pride and arms of the Spaniards who sought to take the New World by force. She would win over the peoples for her Son with the love and tenderness of a mother. She embraced all peoples underneath the “hollow of her mantle”, in the “crossing of her arms,” regardless of whether one was Indian or Spaniard, African or Mestizo. It is notable, then, that in the first Mass reading for this feast day, we read the ancient words of the day when God’s covenant will not only be kept for the Jewish people but for all people, for all tribes of the earth. What joy this is for us! “Sing and rejoice, O daughter Zion! See, I am coming to dwell among you, says the LORD. For them then, for us now, we are Catholic. Our faith is what binds us and holds us together regardless of which tribe, tongue, or people we come from. We have the same Father. We have the same Lord. The Church is Our Mother and Guadalupe came to us — to give us her Son. She is our Mother. She came to the hills of Tepeyac to give her gift to the New World and to reteach the Old World the timeless message of the Gospel of her Son. “Behold, your mother!” (John 19:27). This is the eternal Advent message and 500 years later, many pilgrims still visit Guadalupe’s shrine in Mexico City, built on the ancient ruins of the Aztec capital, Tenochtitlan. Truly, she is our Mother. Our Lady of Guadalupe, Mother of the Civilization of Love and Patroness of the Americas, pray for us! Rachana Chhin is a 24-year-old Catholic convert (via Buddhism and Evangelical Christianity) from Houston, Texas. He received his Bachelors degree from Baylor University where he studied International Affairs and the Great Books. He is now pursuing a Juris Doctorate and Masters in Catholic Studies at the University of St. Thomas School of Law in Minnesota. In his down time, he enjoys reading about current events, listening to classical music, and playing strategy games on his computer. Wake Up, The Glory of the Martyrs Shines Upon You!